A duke's daughter wanted nothing in her life but the sweet nothingness of death, as she felt like her life served no purpose. Her wish was granted when she was killed in an unfortunate accident, yet in a sudden turn of events, she was forced to reincarnate. 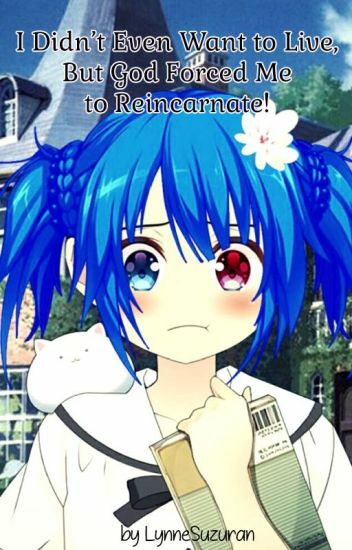 - This novel was previously uploaded by another user under the title of "God Forced Me to Reincarnate". Since her account was gone along with the story, I decided to update this story here again. -This story's also published on other platforms. Please don't repost this elsewhere without my permission! - Each chapter in Wattpad is short (approx. 1000-2000 words). - Full title : I Didn't Even Want to Live, But God Forced Me to Reincarnate! - Current cover picture is not mine, credit goes to the original artist. How to Handle A Little Prince? Trapped in A Messy Situation, Solution Please? The Plan (2) a.k.a The Sudden Training Session! The Plan (3): What's Your Disguise? I Wanna See Your Swordsmanship! Hey! Rui here with my FIRST book. Hope you enjoy~♥! Kinda it's a re-write! 'Perfect' how I despised that word with all my heart. People only use you when you are perfect. Right? Trust no one. Talk to no one. Don't show them your weak side or not they will take advantage just like me. Now that I have a second chance in life. Do I even trust all of them? A new family. New friends. Yet I feel nothing. Why is that? [[WARNING]]: There might be wrong spellings and grammars. Because English is not my FIRST language. 2.Catch a few magical pets as partners. Aiko (meaning: little love) was always a cheerful kid and only child. After her parents were in a car accident after trying to pick her up at her daycare she became very quiet and timid. She was adopted by her grandmother who she barely knew. Her grandmother hired teachers to teach her at her home making her learn from reading and writing to etiquette and postures. After a couple of years it was Aiko 18th birthday, coming back from the bakery Aiko was hit by a motorcyclist delivery man. She was pronounced dead. Reincarnated as a Villainess inside a Otome Game called "Its either me or him". I can either be killed or live a miserable life, let's choose neither! I will make this my own life! DISCLAIMER: This is my first book so please be aware of any mistakes I make. I don't take credit to any pictures. Picture credit goes to respective owners. I search them on Google. All her life revolve around being a shut-in worker, she was a total definition of anti social, but it didn't last long after a tragedy happened; She didn't get to read her newly bought book, when she died from a truck accident. Now as she awoke, she found herself in strange yet familiar world. Will she remain as is or is she meant for something greater? (PREVIOUSLY TITLED: New World: ITITH...NR) the author is too lazy about the title. Caramel is the 21st century 18 yr old high school senior student. She lost her parents when's he was 1 month old and was adopted by her uncle and aunt. but they only adopted her for her money. Depressed , she drowned her self in otome game and found herself being happy. In every game she found the  female mc. cute and sweet and the villainess  a brat. But ,there was one  game where she despised the female mc and all male mc and sided with the villainess, Anna Tsubaki.Anna Tubasaki became a villian after being falsely accused and exicled from the country for 10 years at the age of 5 year. After playing her game and sleeping, she found her self in the villainess a.k.a Anna's  body. now , determined to take the revenge for the villainess , she does everything to become the game worlds most powerful character . but little did she know that her actions attracted a new character and the princes that accused her also wanted her . A sudden change happens in the body of this infamous, but young beautiful sadist who no longer contains its core- the sadistic soul. As she was found out to be a very sadistic and impure girl, by the aristocrats, she was grounded in her home, for one whole year, but escaping will be easy, of course, everything bad is easy for her to do. After making a stupid mistake, falling off a willow tree after spying her capture target, she wakes up a different person. Instead of being the actual 'Infamous Lilly Fiske', she was now an 'Different Lilly Fiske'. Who knows what happened to her? Mida Rose, a Japanese highschool girl, was eccentric and unpredictable, so many rumors spread of her. But, she doesn't mind. One day, she died unexpectedly- not to get killed by truck-san, but to get killed by pancake-san and its gang. But, she was lucky to reincarnate- but unlucky to be in the body of a cruel damsel (that sadist I told you about). Now her journey continues, what will happen next? Credit to owner for the illustration in the cover. Jane is a nerdy girl that was having awesome grades all her life,she had no friends because she finds it hard to get along with people. She never had a crush, or a person to look up to before she died. She died having no friends and has not fallen in love yet. She saved the wizardess disguised as a purple cat. She was reincarnated as Valentine Hart which was the heroine of the new game she heard from some otome crazed girls. Join Valentine in her adventure in, "Enchanted Love In Fantasia"
I don't own the pictures. And the otome game: Enchanted Love In Fantasia is fictional. And that is all thank you hope you'll enjoy the story. Misaki  never left the hospital her whole life. From the minute she was born, her mother died and she almost did too. Both her mother and her was born with a rare disease that weakened the body. As such she had to spend her whole life in the hospital. She never was allowed to run and play. She was always alone. Her father never visited because he didn't want to go through the pain all over again so he pretended that she died along with her mother. He did at least provide her with a tutor. But because she was too smart, she learned everything at the age of ten. It was then she realized the reality of the cruel world. Now being only fifteen  years old she knew she wouldn't live to her sixteenth birthday. She knew she was dying. She knew that her time was up the day of July 21st, the day before her birthday. And for the first time in her life, she wished to have another life. Closing her eyes at the thought, Misaki fell into eternal sleep. Now as Astra, she re-lives a life completely different from anything she could imagine. Not only is she the daughter of a duke she is also a wolf! She has an older step brother, sister, and little brother. A new mom and an overprotective father. But things take a turn for the worst when she meets the royal family and is thrown into affairs where she has to protect herself and those she loves from any enemies who wish to cause harm to those around her. Find out how Astra deals with her new life in proving her innocence in matters when the Royal heirloom goes missing. Along the way she learns who her friends and enemies are yet she cannot figure out who the boy in the black cloak is and if he is a friend or foe. There's a girl whose existence  was  forgotten. She was intrigued by the occult and had decided to perform a ritual to transport her to another dimension. It works. She ends up switching bodies with the 10-year-old mysterious daughter of a rich noble family. A heroine, a demon, a demon king, a few capture targets... Seriously, how did things turn into this?! Cover was created by @DeadlyCuteSushi. Story is being edited with the help of @sandwicheshaverights.